Leave nothing to chance – The Luxxamed HD2000 + offers you as a doctor, physiotherapist or non-medical practitioner a well-rounded concept consisting of an assessment of the respective condition of the tissue to be treated and a resulting individual therapy. 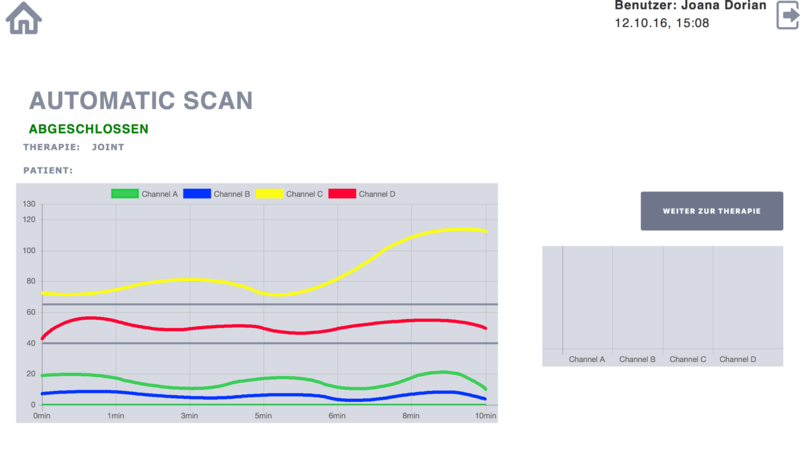 The illustrated graph shows the incoming scan for the therapy. This is 10 minutes for the patient in the first session. By measuring the charge ratios, an individual therapy program is put together for the patient, or rather for the respective tissue. 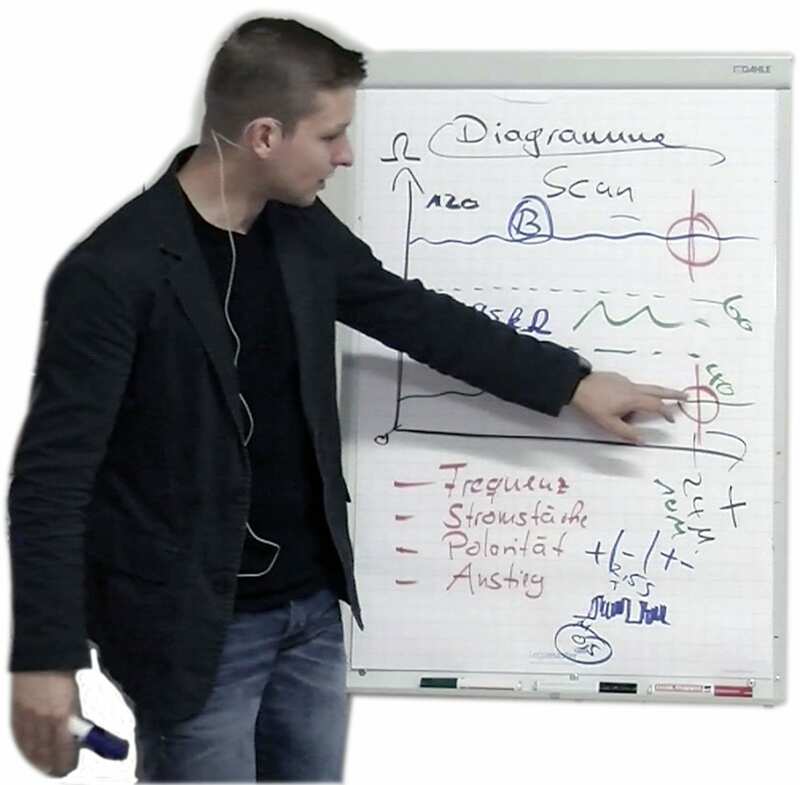 Based on the measurement of each individual channel, a target value is determined, which you, as a user, can incorporate into the diagnosis and assessment of clinical pictures. The treatment with the Luxxamed HD2000 + has a running time of 24 minutes to optimally ensure the therapeutic-metabolic access to the tissue. During therapy, patients can sit or lie down comfortably. 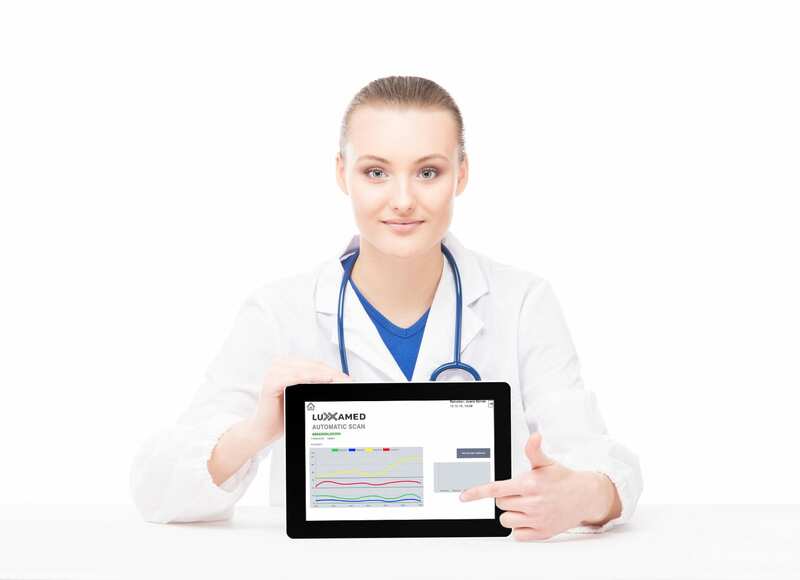 As a user, you can follow the course of therapy via the Apple iPad or the Luxxamed Panel PC “live". You want to know it very well? Then go on here! Prof. Dr. Harold Saxton Burr, a professor at Yale University (School of Medicine), was considered a pioneer in electrodiagnosis. Prof. Burr was one of the first to describe the relationship between electrical resistance in human tissue and the associated pathological change. (Oschmann, 1996) Based on this scientific discovery, Luxxamed therapy uses this electro-metabolic basis. Thinking further, the HD2000 + can influence the distribution of ion and water content and, in addition, the pH value via its measurement / scan and simultaneous influencing of the tissue resistance. All living organisms must constantly evolve and adapt to external circumstances. Therefore, they are constantly functional as well as metabolic in a dynamic entropy state, i. stable against minor changes, but unstable to major changes. Since man, thermodynamically speaking, is an open system, in normal conditions, metabolic, he is constantly in an exergonic energetic state, i. a stable phase, expressed by the free enthalpy ΔG, which determines the metabolic reaction direction. Metabolic processes of biological structures are characterized by the constant production, conversion and consumption of energy which, on the one hand, serve to maintain different states of stress by different ion concentrations on both sides of the biological membranes and, on the other hand, to transfer information between the various organ systems between and within the cell. energetic level to about 37 degrees Celsius as core temperature and up to 28 degrees Celsius as shell temperature (human) at an ideal pH of 7.4. Thus one can assume that all of his metabolic processes move around this energy level in a certain physiological range of variation of the redox potentials. Energy production occurs as part of cellular respiration in the formation of water (H2O) and in the consumption of ATP. This always leads to an electron transfer and thus to a weak electrical flux. The advantage of the HD2000 + is that due to the “feedback process" (the measurement of the HD2000 +), certain modulations are used until the reactivity to the specific modulation by the tissue is exhausted. This means that the industrial organs (for example skin, muscles, tendons) which are in a pathological metabolic state are treated as long as there is an impedance shift in the desired direction. As a result, different organ systems are addressed in succession during a therapy. This is seen, for example, in the case of a therapy that leads to a loosening of the muscles, improved displaceability of the fascia, swelling and pain reduction with increased extensibility of the muscle. Physiotherapist Meggi Mohrbutter conducted a randomized double-blind study using the precursor Clinic-Master in patients with chronic achillodynia. This study impressively demonstrated the relationship between tissue resistance (impedance) and the patient’s effectively perceptible change (pain, especially pressure pain). Brewitt, B. (1999). Qunatitatvie analysis of electrical skin conductance in diagnosis: histrorical and current view of bioelectric medicine. Journal of Naturopathic Medicine, 6(1), 66–75. Burr, H. (1972). Blueprint for Immortality: The Electric Patterns of Life. CW Daniel Co Ltd. Saffron Walden. Essex. SBN 85435-281-3. Mohrbutter, M. (2011, März). Effekte der biologischen Zellregulationstherapie / BCR (Mikrostrom) bei chronischer Achillodynie (Master-Thesis). Universität Salzburg, Salzburg.